Who Remembers Union School? Despite the fact that the school was torn down over 65 years ago, there are still plenty of people in Crystal Lake who fondly remember the hallowed halls and classrooms where they first learned reading, writing, and arithmetic. Memories of grade school teachers such as Mildred Flanders, Helen Gage, Florence Knox, Roberta Phillips, Mary Rockenbach, and Genevieve Stevenson still circulate in the minds of many Crystal Lake residents. 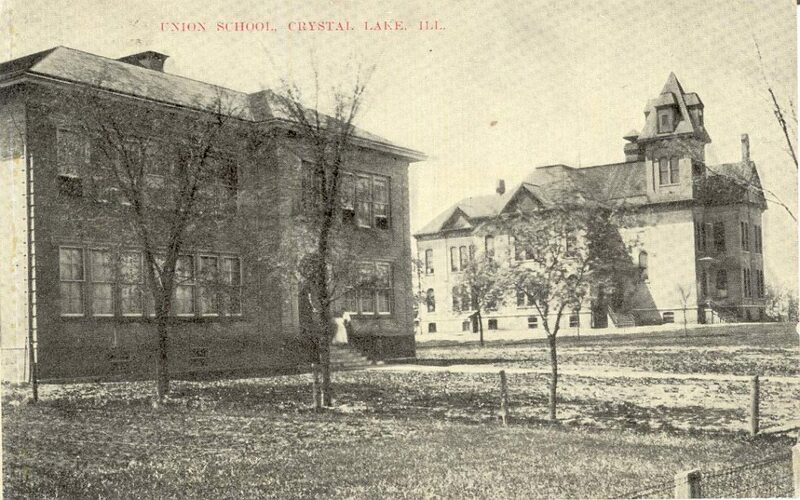 Completed in 1884, the Union Grade School was the first “act of unity” which occurred between the often feuding towns of Nunda and Crystal Lake. Union Grade School was located approximately where Husmann Elementary School’s playground now stands. In the early days, it was known as the “School on the Hill”. At that time, McHenry Avenue was a dirt road with few houses. Before the Union Grade School was constructed, children from Nunda attended the Nunda School, a small frame building located just north of today’s intersection of Route 176 and Main Street. Children in Crystal Lake attended their town’s brick school house, located at the corner of King and Park (now called Pierson) Streets. Both towns had outgrown their small schools. Recognizing the need for additional classroom space, the two towns agreed in the Spring of 1883 to consolidate their school districts and build one large school to meet the education needs of both towns. Amazingly, community leaders from both towns met, voted in a new school board of directors (James Crow, George Clayson and William Butler), and selected a site with little (or no) argument! In those days, The Nunda Herald, predecessor to today’s Northwest Herald, was published each Thursday. With few exceptions, each week’s edition of the newspaper had some sort of update about the school’s progress. From reading the newspaper, we know 200,000 bricks were purchased in McHenry for the school. The architect was Mr. Burling of Chicago. It took a week and a half to dig the 80’ x 80’ cellar (July, 1883). The weekly list of updates continues, as the building progressed. In September 1883, we are not surprised to see the two towns sniping at each other – first arguing if the school site was really in Crystal Lake or Nunda. The Crystal Lake group claimed the location and posted a sign, “Future Site of the Crystal Lake Union School.” The Nunda-ites took exception to the “Crystal Lake” reference, and shouts of outrage were printed! One school director, William Butler resigned. William St. Clair was elected to replace Butler, and things settled down again. By November 1883, work began on the building’s interior. The school was completed in March 1884. Initial appropriation for the building was $15,000, with an $8,000 overrun approved by voters. The first day of school was April 17, 1884. Seven years later, the large, handsome new school was already overcrowded! An addition of two rooms was added in 1901. The cost for the addition was $4500. In 1909 city water was brought to the school. Before that, Janitor McWhorter had to pump 90 pails of drinking water for the school children. And he did that nearly every day. In 1906 a second Union School building was built, also on this site, but further east. It was situated where Husmann School is today. A gymnasium was added to this building in 1914. The architect for the gymnasium addition was a local man, William Chandler Peterson. High school students attended school in the new building until 1924, when Crystal Lake Community (Central) High School was built on Franklin Street. When the high school students moved to their new school, the vacated school on Paddock Street became a junior high school. For many years, the grade school and junior high buildings sat side-by-side. The two buildings were connected by several concrete underground tunnels, used primarily by maintenance workers and staff. Occasionally, on days of inclement weather, students were instructed to use the tunnels between buildings. 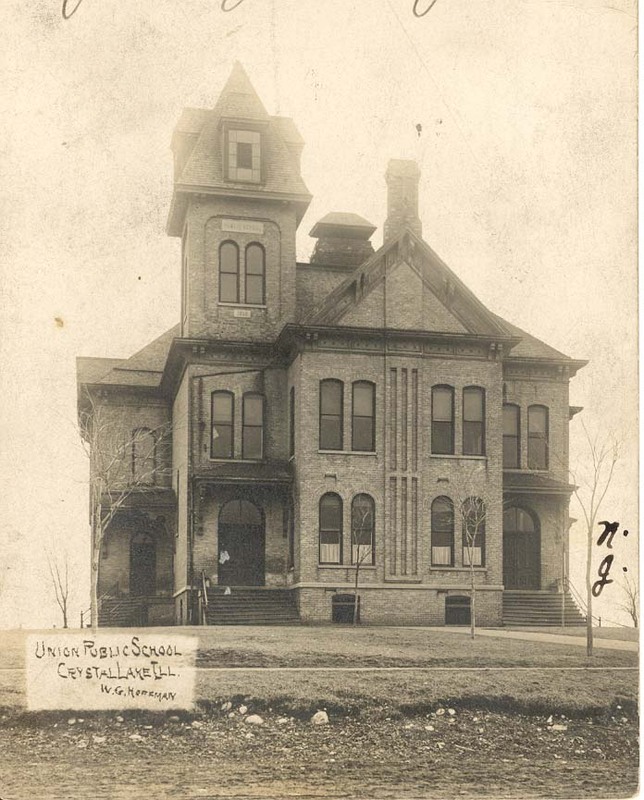 The original Union School building was demolished in 1948. The old high school/junior high building was demolished in 1978 (see video below) and a new school, Central Elementary School, was built on that site. The school’s principal, John Husmann worked hard to save pieces of the old building’s history, including a terra cotta plaque honoring Lt. William Chandler Peterson, who was killed in WWI. These were put on display at the new Central Elementary School. In 1985, the school was renamed Husmann Elementary School in honor of John Husmann. Video of the 1978 school demolition. Video was taken by N. Kenneth Pearson.